Earn your medal of courage on your journey to the Land of Oz in this children's Cowardly Lion costume! Perfect for Halloween or a school play, this costume includes a tan, polyester jumpsuit that features an open-faced headpiece and a matching fur collar 10” long. An elastic band fits around the wrist and ankles of the jumpsuit while a tie is located in the back. 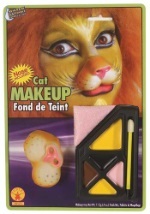 Add your own unique touch to this costume with our lion face makeup kit!